Setting an inventory calendar can be useful for more than just inventory management. It can serve as the framework and guide for your marketing schedule as well. It makes sense to align marketing and promotion with the inventory your housing at the time and to be prepared to turn seasonal stock as quickly as possible. Consistency is often one of the biggest struggles for dealers, and establishing a marketing plan can give you a guide to follow to help you stay on course and in front of your customers in the most effective way possible. First, establish the list of marketing tools you plan to use to reach your customers. Next, reference your inventory calendar to know what items you should be promoting for that respective month. Promotions need to be done in advance of your selling season to prepare customers, so it’s always good to set your marketing plans 3-5 months in advance. 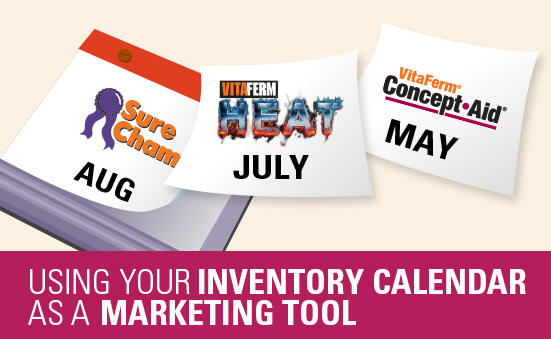 An inventory calendar will help paint a visual picture of the opportunities you have to focus on, what promotional efforts could be combined or if it is necessary to run multiple campaigns simultaneously. Obviously margin and/or volume will factor into your focus each month, but don’t leave out ‘door-opener’ products that could generate traffic or interest as well. Once you’ve established your product focus for the month, detail your marketing plan to include specific tactics, contacts you need to reach out to, deadlines, etc. There are several tools and programs you can use for social media, email marketing and text messaging services that allow you to schedule in advance so you only have to manage these messages once per month. At the end of the month, you should revisit each marketing medium used and analyze its effectiveness so you can make any necessary adjustments for coming months.